KANSAS CITY, Kan. — What could get a group of parents and youths “up and at ‘em” on a cold fall morning at zero-dark-hundred? Would you believe a road trip to St. Louis — to learn more about vocations? “Who wouldn’t want to take a trip to St. Louis, visit one of the most beautiful churches in the United States and eat St. Louis-style pizza with awesome Carmelite Sisters?” asked Father Dan Morris, pilgrimage organizer and associate pastor at Sacred Heart, Shawnee. Father Morris got the idea for this trip two years ago after a smaller pilgrimage to Conception Seminary College in Conception, Missouri. “We knew we wanted to do something bigger this time around,” said Father Morris. “First of all, St. Louis is where we send the majority of our seminarians, including all three seminarians from Sacred Heart. The pilgrims were divided into three groups, depending on where they would spend the second part of their trip. When the buses arrived at Kenrick- Glennon Seminary, all the pilgrims were greeted by archdiocesan seminarians and Father James Mason, rector of the seminary. 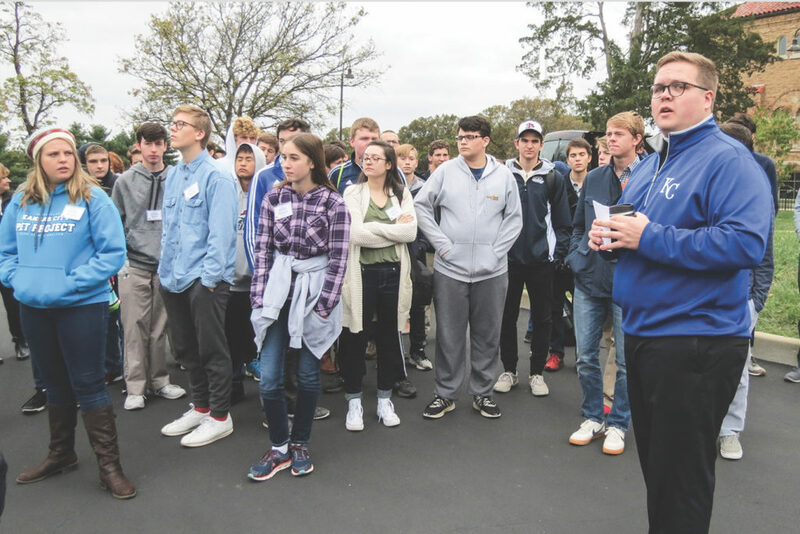 High school students were then assigned to seminarian Anthony Mersmann, Theology II, who showed them the grounds, library, classrooms and a typical student room. When asked what the most challenging part of being a seminarian was, Mersmann told them that it was “being the best person you can be” — all the time! To help and support them, the seminary “has wonderful priests and staff who work with us to become conformed to Christ,” he said. The tours ended in the auditorium, where Aaron Waldeck, who began studies in pre-theology in August, shared his vocation story. After a Q&A session, everyone gathered in the seminary chapel for eucharistic adoration. The high school-age men stayed to have pizza with the seminarians, play a game of pool and catch up with new college seminarians Daniel Mauro and Ryan Geris. Meanwhile, the remainder of the pilgrims headed to the home of the Carmelite Sisters of the Divine Heart of Jesus in Kirkwood, a suburb of St. Louis. There, they were greeted by vocation directress Sister Mary Michael Reiss and visited with other Sisters while eating a pizza and salad lunch. 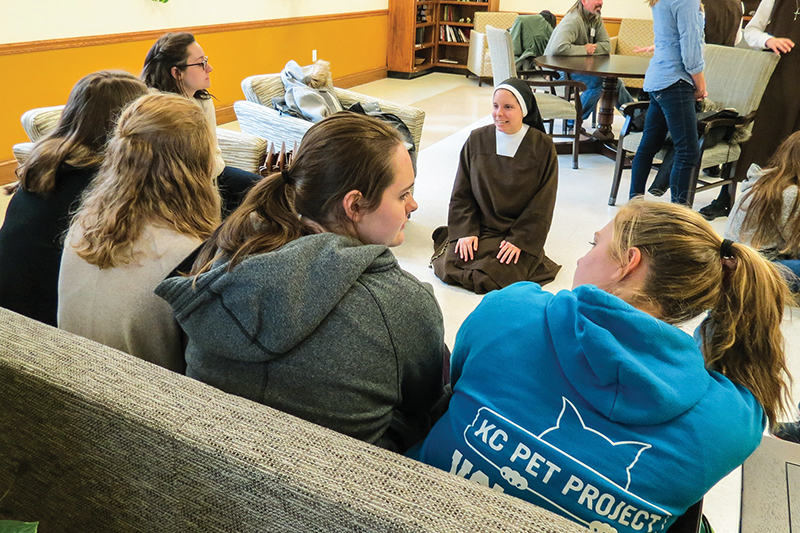 When asked how long it takes to become a Sister, they described the eight-year process to perpetual vows. The Carmelites operate an assisted living home and a day care center. Those were sites on the tour, as well as the grounds where the chickens were kept. “I thought nuns didn’t do anything but pray and go to Mass. But they get to take care of people, run a day care, raise chickens and have dogs,” said Erin Kelly, a freshman at St. James Academy in Lenexa. The last stop was the cathedral basilica located near downtown St. Louis. The massive structure is renowned for the beautiful mosaics throughout the interior. Afterwards, many of the pilgrims mentioned Mass at the cathedral, which was concelebrated by Fathers Morris and Scott Wallisch, archdiocesan vocation director, as the highlight of their trip. After Mass and a group photo, everyone boarded their bus for the return to Kansas City. How did the pilgrimage impact the youths? “I thought seminary was going to be more strict, but the seminarians were laid-back. I was surprised at how nice [Kenrick Glennon] was. I would want to live there,” said Ben Stove. Grace Wohletz, a freshman at St. James Academy, hadn’t realized until meeting the Sisters how joyful and happy they are. And Jessica LaBar, mother of two high school sons, said the trip dispelled a lot of stereotypes she had of seminarians, imagining them sitting in silence and studying. “I was very impressed with how hospitable our seminarians were to such a big group, and how willing they were to spend that much time with everyone,” said Father Wallisch. Finally, does Father Morris think the pilgrimage accomplished what he hoped? Absolutely! “Several of our high school boys have commented that having visited the seminary and having had the opportunity to see and speak with our seminarians, they now consider this a real option should God call them to discern the priesthood,” he said. The Carmelites, too, made quite an impression. “Several of our young women were inspired by the Sisters,” said Father Morris. Even the adults on the pilgrimage were wowed. Meeting the Carmelites, said LaBar, gave her a new perspective on religious life. “I’ve had more exposure to Sisters today than in my whole life combined!” she said.